In April 2009 I did a review of Street Fighter 4. I managed to get my hands on Capcom’s latest fighter, Tatsunoko vs Capcom and I can already say its Street fighter 4 but faster, crazier and very Japanese. If you’re familiar with the VS series, you should feel right at home with Tatsunoko vs Capcom. The game was developed by Eighting and was originally realised exclusively in Japan. Due to high demands it was released a year later in the west with extra modes and more recognisable western characters like Frank West from Dead Rising. If you have never played a VS game before, here is a quick summary. It plays like a regular Street fighter game but everything is put on turbo. The combos reach double digits regularly, the speed is much faster, and it’s all about being as aggressive as you can rather than staying at the other end of the screen firing fireballs at your opponent. The game allows you to select two fighters which can be switched at any time during the match. The game is a four button fighter which consist of fast, medium, strong attacks and the forth button is to call your partner to assist. Combining these attacks can cause some devastating combos which send opponents flying into the air and across the screen. This is the basis of a VS game. You chain together a huge combo and send your opponent into the air. After following your opponent into the air you perform a second chain of combos and while on the way down you switch your character who will perform a third chain of combos, ending it with a special move. Surprisingly your opponent will still be alive. The health meter in Tasunoko vs Capcom depletes a lot less compared to Street Fighter 4, and for good reasons. There is a lot of fun in finding new combos out with different characters and working out which two characters suit your playing style. The game allows all control styles making it accessible to everyone. Experienced players will naturally gravitate towards the Wii Classic Controller or the Gamecube controller, but new comers will want to start on the Wii Remote / Nunchuk or the sideways Wii Remote. The last two control styles are very accessible to newcomers because it plays very much like Super Smash Brothers Brawl. The buttons are condensed down to two attacks, one button for all the special moves and the second button for the regular attacks. This doesn’t put a newcomer at an advantage as there will be a limited amount of moves a player can perform, but does allow them to put up a bit of a fight without having to spend hours on the game learning the command list. Tatsunoko vs Capcom was made from the ground up on the Nintendo Wii and takes advantage of what the Wii is capable of. The game uses cell shaded graphics to give it that Japanese Anime look which works really well with the theme of the game. All the hyper moves and special moves use very flashy effects that look good for a Wii game. The animation of each character is very smooth with the moves transitioning really well from one to another. An online mode is featured in the western release of Tatsunoko vs Capcom that has no lag what so ever. There are three modes online and an ability to add a friend using friend codes. Thankfully Capcom have realised how tedious friend codes can be and have given the ability to simply register someone you have played online. 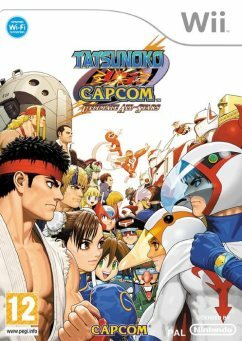 Tatsunoko vs Capcom is a great game that every fighting fan should own. It’s fast, hyperactive and very Japanese. You may not recognise the Tatsunoko roster of characters, but once you play it, it won’t matter.